How Do I Ditch These Crutches? I’ve been cleared for full-weight bearing by my doctor. She recommended ditching the crutches and knee scooter as soon as I felt comfortable. She said I could use a cane or single crutch as a transition device but to go to FWB as soon as possible. Any tips or techniques for the transition from partial weight-bearing to full weight-bearing? The only half-decent advice I’ve found is this YouTube video. I’m also starting physiotherapy on Monday. I transitioned into partial weight bearing after the third week, as per doctor’s orders. Crutches, bad foot, good foot, around the apartment in tiny laps, mindful that many studies show patients are completed unable to gauge the amount of weight they exert on their injured leg. At first I would slide the good foot up to the bad foot, ensuring that the crutches/bad foot didn’t bear the full weight at any point. Slowly I’ve worked toward a more normal walking motion, still aiming to put only 10-25% of my weight on the bad foot itself. I’ll never know if I’m successful in that target. The miracle of partial weight bearing is that it made my foot feel like a living thing again. For the first three weeks, it felt like there was a dead swamp rat attached to the end of my leg. Now it’s alive! And much less swamp-ratty! The foot muscles would twitch and flex and generally it felt much more like a good foot trapped in a boot. That’s the danger of course: believing that it is healed. It’s nowhere near being a good foot. But at least it’s no longer a dead foot. Two days ago, I took out another wedge from inside the boot. I didn’t have the same stretching feeling that I had when I took out the first wedge. But it’s much easier to fit my leg under a desk now. Still two wedges in the boot. When I sit down my right knee is about three inches taller than my left knee. I took a day off from partial weight bearing when I took out the wedge to allow my ankle to adjust. Now I’m back to tiny laps, crutches, bad foot, good foot. A bit further every day. In any case, I just wanted a professional to look at it and tell me that something was healing… even if it was a complete guess on their part. The doctor removed one of the wedges which keeps my foot in the equinus position (toe pointed down), lessening the severity of the angle. The doctor also handed me an achilles recovery timeline. The aircast has been much more comfortable. I can feel a stretch in my achilles area. It’s similar to the feeling of a muscle being stretched. As the wedge is out, the back of the ankle is being lengthened. My ankle is slowly being moved back toward a natural position. Before this, I was constantly adjusting the aircast because of pain on the top or sides of my foot, or the big toe. Now it fits much better. I’m pretty sure everyone on the basketball court heard the pop. They all stopped playing. “Are you alright?” someone asked. I was on the floor, but in no pain. I assumed I’d just stepped on something that had annoyingly found its way onto the court. I looked back to see what it was. But there wasn’t anything. Immediately, I thought “So this is how Derrick Rose must have felt. Huh.” I stood up, still no pain, but my right foot no longer felt like it belonged to my leg. “I’m going have to come out,” I said and hobbled off the court. At the YMCA desk, an employee with paramedic training had me point my foot and flex it, which I could still do, a bit. He thought nothing was wrong. But about 10 minutes later my whole foot and ankle was swollen up big time, and I was in some pain, although still not too much. I hobbled two blocks back home and put it on ice. The next morning I went to the clinic and the doctor sent me to emergency. They did not do any scans, but declared it a really obvious achilles tendon rupture. They put me in a splint, which consisted of a strip of plaster cast on the top of my foot, ankle, and shin wrapped in gauze. It was very effective. I could not move my foot at all. I was to come back in two days to see the orthopaedic surgeon. They cut off the cast when I came back and said ‘yep, that’s an ATR’. Again no scans necessary. The doctor said she could see the two ends of the tendon and they weren’t far apart. She said I could have surgery if I wanted to but, more and more, they were treating these without operating. That was confusing to me. She told me about various studies but gave no recommendation. Then they put me in an aircast, a boot with straps and air pockets, but no breathability, and said I had two days to decide about the surgery. I did more research. I didn’t want not to have surgery because of fear of the knife. But then again I didn’t want to have unnecessary surgery just to prove that I wasn’t afraid of the knife. Maybe surgery reduced the rate of re-rupture, but maybe not. It definitely carried a significant risk of infection and complications. I changed my mind back and forth many times. But I only called back to book my next appointment, with the same doctor, to check in two weeks later. Then I bought a used knee scooter because crutches are the worst. 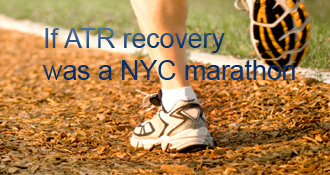 faust has completed the grueling 26.2 ATR miles to full recovery! I was initially told to put about 45-50lbs of weight on the injured leg. I used scale to feel what that means and tried to apply that while walking with 2 crutches. Pretty soon I transitioned to walking with one crutch. When I noticed I just carry the crutch in my hand I realized I am ready for FWB, so ditched the crutch. I have it in my vid from week 6-7. I was basically practicing walking slowly for short periods of time, but pretty frequently, when there were no distractions around. It was a good frequent break from computer in my case. One thing that helped me walk much smoother was Evenup. I got it 2 days after starting PWB and it made a huge difference in a quick transitioning from NWB to FWB, as well as walking with a normal gate in a boot. Good advice from pj. Everyone’s foot handles it differently. I didn’t really follow anything. When the doc said to put about 30-40lbs. of weight on it, I just lightly stepped (with the crutches). Gradually, I stepped harder and harder - letting off when I felt too much pins and needles. And, like pj, when I was just standing, I kept trying to stand with more weight on the bad foot - again, letting off if the pins and needles came. Gradually, I got to the point where my foot could handle all my weight when standing, and much of my weight when “walking”, in the boot. You’ll get there - it just takes a little time. Work with your PT, and do what they tell you - you’re getting there! Good advice. Thanks for sharing. I’ll be sure to ask the PT specialists on Monday. If they have anything interested to add, I’ll create another post. I pretty much followed the advice in that video. I started by using 2 crutches and stepping through with hardly any weight on the boot, then added pressure from there. I also sat normally in a chair - both feet on the ground (with the boot on) and let my bad leg get used to the light pressure that created. Up until that point I always stretched my leg out or crossed it over my other leg to keep weight off. Then it was kind of a leap of faith at the end. I stood at the kitchen counter and side-stepped side to side while using the counter for balance. Kind of similar to a PT exercise they had me doing early on - standing and shifting weight from side to side. Hope some of that helps! Good luck. I’m sure the PT folks will have some advice, too. Would be nice to have a little more confidence from your doctor. But trust your own instincts and the research you did. My OS is the doctor that did the Ontario study. He’s a good guy - knows what he’s doing! You made the right decision for you. Always believe that. Just measured the heel lift. It was just under 7cm (or 2 3/4″ ). Now it is just over 5cm (or 2 1/8″). Sounds like progress! Every little bit helps. I don’t think I’ll get wedges removed until 6 weeks, but hoping things progress quickly from there. Welcome to the club, Faust! I know, none of us wanna be members, but here we are. We’ll get thru this! Good luck on your non-op recovery. I, too, am doing non-op and am at my 3-week mark since they said I couldn’t have the surgery. I use the crutches around the house, and outside sometimes. I use the knee scooter at work. Knee scooters don’t work very well in the grass, especially if the soil is soft/muddy! If I had ATR I would definitely go the no surgery route Good luck with the healing. I loved the knee scooter though they have many knee crutches now which also are better than regular crutches. Faust’s Journey Back is proudly powered by WordPress and WPDesigner..